Tarot cards are old, but that doesn't mean they're boring. Tarot cards add an air of mystery and emotion to any performer's arsenal. This ebook will show you a whole new frontier of possibilities with these arcane works of art. Spectral Chill is as much a concept as it is a trick. And the bonus trick, Tarot Below Zero is just one possibility to be found at the tip-of-the-sword in this re-conceived paradigm. 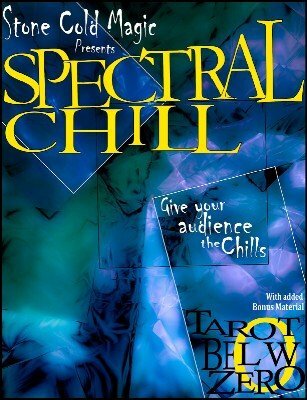 Tarot is all about creating links in the mind of the spectator and Spectral Chill is a system to help do exactly that. This is an effect that will just give your audience the willies . . . simply put, using a Tarot deck, the participant does all of the shuffling and dealing. She shares a personal experience about a lost loved one. She tells you that she was 20 years old when it happened. Using the deck that she shuffled, she finds that the 20th card is the Death card. She tells you about a new romantic relationship that started on the 15th of the month. She finds that the 15th card is the Lovers card from the Tarot. She asks about a promotion and pay raise she received on the 10th of the month. She finds the "Wheel of Fortune" card in the 10th position. The E-book is a pretty darn comprehensive study of a concept that's been around forever. This concept presented the way Jeff has been presenting it for years has, on many occasions, left people literally with the creeps, the willies, the chills, whatever you want to call it. No matter how much Jeff disclaims the "power," etc., they don't believe his disclaimers. In fact, very often, people truly believe that some other unexplainable force or something is at work. They do not view it as a trick. They believe it is real. That's just with a plain old deck of cards. Now that Jeff has figured out how to apply this concept to Tarot cards, the creep-out factor jumps up several notches. If you want a truly chilling effect where you truly connect with your participant, this is it . . . Tarot Below Zero. This ebook covers the entire journey from the concept's origins right up through to Jeff's application of it. You'll see the morph from the Spectral Chill concept into the Tarot Below Zero concept followed by the morph into Brad Gordon's Final Chill. You'll learn the concept in great detail aided by free video footage. Then you'll learn every way Jeff has applied this concept over the years. And finally, you'll learn how to apply this concept to Tarot cards for that added freak-out factor. 1st edition 2011; 53 pages.